Have you heard these bird sounds? 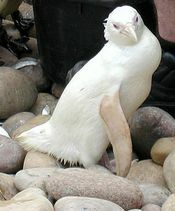 Albino African Penguin: Ever seen one? Bird sounds and songs – how good are you at recognizing them? A new day begins in the Australian Bush. The melodious song of Magpies and the chuckling of Kookaburras may be heard among a beautiful tapestry of morning birdsong.